Just a few years ago, it seemed to be absurd to replace kerosene based aviation fuels with biofuels derived from renewable resources. The cost of producing alternative fuels that meet the high requirements in this industry was the economically restricting factor. What happened? The 2008 spike in oil prices boosted new interest. Today, biofuels offer great hope for aviation to reduce its carbon emissions and to ensure reasonable price stability – unlike petrol derived fuels. Among the pioneers in this industry is Virgin Atlantic which has become the first airline to fly with biofuel in 2008. The airline (which was founded by Richard Branson who also invests in algae biofuels) sent a Boeing 747-400 from London to Amsterdam, carrying in one of its four fuel tanks a 20% mix of biofuel derived from coconut and babassu oil. That may not sound like much, but it was the premiere for a commercial aircraft using renewable energy. Also in 2008, The Air New Zealand Boeing 747-400, powered one of its four Rolls-Royce RB211 engines with a biofuel blend derived from a second generation biofuel plant – Jatropha Curcas. The Air New Zealand test flight was a joint initiative with partners Boeing, Rolls-Royce and Honeywell’s UOP. In 2009, a Continental Airlines Boeing 737 flight, partially powered by algae and jatropha, reported a decrease in fuel consumption in the biofuel engine compared with the one running conventional jet fuel. In other words, the biofuel performed better than the kerosene Jet A1 fuel. Japan Airlines conducted in 2009 a one hour 747-300 flight test using a B50 blend of camelina, jatropha and algae based biofuels. Also here pilots reported that the biofuel was more fuel efficient than 100% traditional jet fuel kerosene. A KLM Royal Dutch Airlines jumbo jet and its 40 occupants circled above Holland for a couple of hours powered by a 50:50 blend of kerosene and camelina derived biofuel. It was the first flight by a biofuel powered airliner to carry passengers. This happened in 2009. Encouraged by these promising results many further airlines like British Airways, Alaska Airline, Quatar Airways, Brazilian Airline, Lufthansa and many others conducted alternative fuel powered flights. Beyond successful test flights some representatives of the airline industry started to get involved into further development and large scale production of such biofuels. To establish the complete or even partial substitution of kerosene some more work has to be done yet. British Airways and Solena Group are launching a sustainable jet-fuel plant as British Airways plans to use the biofuel to power part of its fleet from 2014. The plant will convert about 500,000 tons of organic waste into 16 million gallons (about 60.5 million liters) of jet fuel each year. The conversion to this renewable fuel will be performed by a process called Fischer-Tropsch. Australian airline Qantas has signed a deal to research the use of the algae based aviation fuel developed by US company Solazyme. Neste Oil and the German Lufthansa have signed a cooperative arrangement about Lufthansa’s commercial flights using NExBTL renewable jet fuel which derives from palm oil. The start is scheduled 2011. Regarding these efforts, it seems obvious that the switch to sustainable and even more efficient aviation fuels is just a matter of time. The increasing use of jatropha or algae as feedstock, or like in the case of BA and Solena municipal waste, are about to establish 2nd generation biofuels and will consequently avoid food versus fuel problems. This development will not just be restricted to the airline industry but also impacts the global biofuel situation, especially a beneficial effect for the automotive sector. As I understand the orsceps, the algie is used for the conversion of simple sugars to jet fuel and other green products now being made from petroleum. The leaset costly orscepsing should be utilizing dedicated high yielding sugar based feedstock that go directly to renewable fuels through a low cost conversion orsceps. Yep! 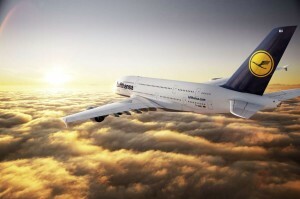 Biofuels in the Airline Industry | InnovativeIndustry.net is 100% correct. There is no other way….